“Each of my long -necked women bears a story of hardship. They are usually sombre in expression and appear proud in their demeanour. This is because they have overcome in one way or another. They have not allowed their struggles to break them. They choose to carry on and in doing so they triumph. I have seen these tales first hand throughout my life and they inspire the core element of my work”. 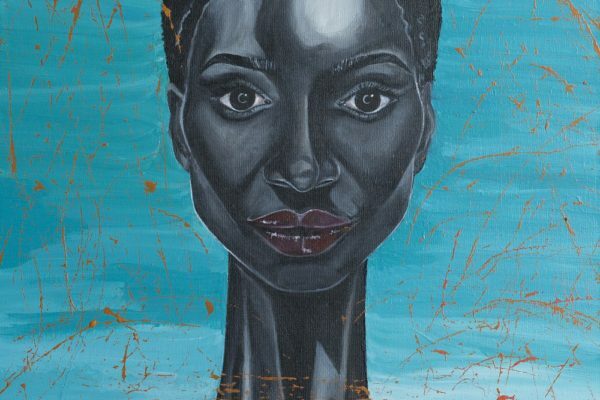 There will be an opportunity to meet the artist herself and during this launch event which will be chaired by Arlene Isaacs-Lowe, Managing Director Moody’s Investors Services. Arlene was named in the 2016 powerlist list of the most influential people of African and Caribbean heritage in the UK coming number 3 on the list ahead of the likes of Sir Lenny Henry, Lewis Hamilton and Sir Mo Farah. She is also an advocate for women especially of black descent in the male-dominated Financial industry. Other highlights during the evening include a poetry reading by Chanje Kunda and a reading from ‘In the Ditch’ to mark the life of Buchi Emecheta, the renown Nigerian writer and activist who died on January 25, 2017, in London, United Kingdom. The exhibition will continue throughout the month of March at the gallery’s usual opening times (11AM – 6PM) concluding on Sunday the 2nd of April 2017.